This 2.4 x 2.4m National Trust Ickworth Summerhouse has recently been installed in our customer’s garden in Chard, Somerset. This Ickworth fits perfectly in the customer’s garden with the soft, neutral tones of the shingle and the paving slabs, as the summerhouse has been painted in National Trust Dome Ochre, a very similar colour. All of these various shades of beige and cream lighten the customer’s garden, making it look bigger than it is, as well as making it look very smart. The Ickworth looks as if it was actually made to fit into this garden. The Ickworth has got an apex roof with a roof overhang measuring 42cm in depth. This roof overhang will help protect the front of the summerhouse from rain and other forms of precipitation, and shade it from the sun. There are double doors at the front, with a window on both sides of them and another two windows, one on each side, both of which can be opened. As you can probably tell from the picture, the National Trust range of buildings is very traditional in appearance; this is because the range was designed with the outbuildings of National Trust property outbuildings in mind. This means that they incorporate stylistic features that were popular in outbuildings from 50+ years ago. These stylistic features include the cast iron door furniture, the corrugated roofing material and the vertical sawn cladding boards. The National Trust range of buildings are perfect for customers who prefer the more traditional ways of life and suit gardens that reflect this traditional character best. 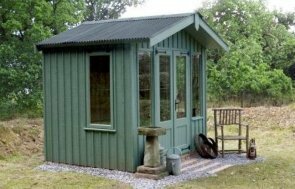 If you would like a National Trust summerhouse or shed of your own, please contact us or call us on 01760 444229 to speak to one of our helpful team.